The Romani people are a distinct ethnic and cultural group of peoples living all across Europe, who share a family of languages and sometimes a traditional nomadic modes of life.[which?] Their exact origins are unclear and even though their culture has been victimized by other cultures, they still found a way to maintain their heritage and society. Linguistic and phonological research has traced the Roma people's first place of origin to places in the Indian subcontinent, specifically linking Proto-Romani groups to Central India. Many[quantify] report in extracts from popular literature that Romani emerged from the North-west regions of India, rather than from Central India. Features of phonological developments which emerged during the early transition stage from Old to Middle Indic prove that the history of Romani began in Central India. The Romani language shares many features with the Central Indo-Aryan languages such as the Hindi, Urdu, Punjabi and Rajasthani languages; it also shares connections with Northern Indo-Aryan languages like Kashmiri, and the language itself contains a cluster of Persian and Arabic words. Linguists use these phonological similarities as well as features of phonological developments which emerged during the early transition stage from Old to Middle Indic to conclude that the history of Romani began in Central India. Other factors such as blood groups and unwritten customs also suggest Central Indian origins of the Roma. The Roma find issues with documenting their own exact origin due to a lack of finding specific records left by ancestors. Their history however is retold by clan family customs, such as singing and storytelling. Records cannot identify exactly why the Roma migrated from India; there are a number of possible motives, such as famine and military invasions on the part of Alexander the Great (356-323 BCE) and/or Mahmud of Ghazni (971-1030 CE). The Romani people are today found in many countries. Typically, Romani adopt given names that are common in the country of their residence. Seldom do modern Romani use traditional names from their own language, such as Papush, Luludi, Patrin, etc. Being the only Indo-Aryan language that has been spoken exclusively around Europe since the Middle Ages, speakers use many terms for their language. They generally refer to their language as řomani čhib translated as ‘the Romani language’, or řomanes, ‘in a Rom way’. The English term, Romani, has been used by scholars since the 19th Century, where previously they had used the term 'Gypsy Language'. Traditionally, Roma place a high value on the extended family. Marriage in Romani society underscores the importance of family and demonstrates ties between different groups, often transnationally. Traditionally an arranged marriage is the desired set up, with the parents of each family looking for an ideal partner for their child. Parents rarely force a particular spouse on their child, although being married by your mid twenties is generally regarded as the norm. School, other marriages, and events are also a popular environment for finding a prospective spouse, however they should be supervised by an adult. With the emergence of social media such as Facebook and mobile phones, and education in women becoming more prominent, traditional and conservative views are becoming less rigid. In some Romani groups, for example the Finnish Roma, the idea of marriage is ignored altogether. Traditionally, it is a patriarchal society and virginity is considered essential in unmarried women, this is because it is a visible representation of the girl's representation and the honour of her family. Men and women often marry young. The Romani practice of child marriage has generated controversy in many countries. In 2003, one of the many self-styled Romani "kings", Ilie Tortică, prohibited marriage before the parties were of legal age in their country of residence. A Romani patriarch, Florin Cioabă, ran afoul of Romanian authorities in late 2003 when he married off his youngest daughter, Ana-Maria at the age of twelve, well below the legal marriageable age. Bride kidnapping is thought to be a traditional Romani practice. Girls as young as twelve years old may be kidnapped for marriage to teenage boys. This practice has been reported in Ireland, England, the Czech Republic, the Netherlands, Bulgaria and Slovakia. Kidnapping has been seen as a way to avoid a bride price or a way for a girl to marry a boy she wants but that her parents do not want. The tradition's normalisation of kidnapping puts young women at higher risk of becoming victims of human trafficking. The practices of bride kidnapping and child marriage are not universally accepted throughout Romani culture. Some Romani women and men seek to eliminate such customs. Romani customs often establish that the groom's family must pay a bride price to the bride's parents. Romani social behaviour is strictly regulated by purity laws ("marime" or "marhime") respected by most Roma and among Sinti groups by the elder generations. This regulation affects many aspects of life and is applied to actions, people, and things. Parts of the human body are considered impure: the genital organs, because they produce impure emissions, and the lower body. Fingernails and toenails must be filed with an emery board; cutting them with a clipper is taboo. Clothes for the lower body, as well as the clothes of menstruating women, are washed separately. Items used for eating are washed in a different place. Childbirth is considered "impure" and must occur outside the dwelling place; the mother is considered "impure" for 40 days. Death is seen as "impure" and affects the whole family of the dead, who may remain "impure" for a period after the death; usually private items of the dead are considered to be impure and are to be buried in his/her grave or given to non-Romani poor people. It should be noted that "impure" is not literal but rather linked to cleanliness. Many of these practices are also present in Hindu cultures. However, unlike the Hindu practice of burning the dead (There are burial in certain Hindu traditions as well), Romani culture requires that the dead must be buried. Notable deviations from this practice exist among German Roma and British Romanichal, the latter holding a tradition of cremation similar to that of some Hindu cultures. Up until the mid-20th century they invariably burned the deceased person and all their earthly belongings, including the dwelling place, all which was considered spiritually impure. During the latter half of the 20th century British Romanichal began adopting the burial customs of their Continental cousins. It is believed the soul of the deceased does not officially enter Heaven until after the burial. Romani people incorporate their values into how they raise their children. There is an element of impurity placed upon both the mother and father after the mother gives birth. This impurity is lessened if the child is a male and the family is considered “lucky”. Traditionally, the couple will live with the father of the groom until their first child is born. Romani people place high value on extended family so godparents, along with this other family, are active in the child’s life to ensure its well-being. The child’s parents often do not have an input in what their child eats throughout the day, so the child relies on eating whatever happens to come their way. Romanipen (also romanypen, romanipe, romanype, romanimos, romaimos, romaniya) is a complicated term of Romani philosophy that means totality of the Romani spirit, culture, law, being a Rom, a set of Romani strains. An ethnic Rom is considered to be a Gadjo (non-Romani) in Romani society if he has no Romanipen. Sometimes a Gadjo may be considered to be a Rom if he has Romanipen, (usually that is an adopted child). As a concept, Romanipen has been the subject of interest to numerous academic observers. It has been hypothesized that it owes more to a framework of culture rather than simply an adherence to historically received rules. Significant changes in Romani culture following the Second World War have been attributed to the suspension of these social norms as strict rules relating to food and to contact with certain classes of people broke down. This period also coincided with a perceived loss of authority invested in traditional leaders, the primary maintainers of Romanipen. Furthermore, the Roma who found themselves under Soviet control during the war, while deported to the east of the Urals and often persecuted, were generally left alone to follow their orthodox practices and thus preserved strict interpretations of Romanipen. However, the Roma who lived in other countries of eastern Europe, in the face of widespread discrimination and society's attempt of forced assimilation, often had to compromise their strict interpretation of the customs just in order to survive. As a result, the whole concept of Romanipen became interpreted differently among various Roma groups. A considerable punishment for a Rom is expulsion from Romani society. An expelled person is considered to be "contaminated" and is shunned by other Romanis. Travelling Roma left symbols or signposts for their traveling fellows, known as patrins (an old word for leaf). Romani Code, or Romano Zakono, is the most important part of Romanipen. It is a set of rules for Romani life. Rules of Romani Code describe relationships inside the Romani community and set limits for customs, behavior and other aspects of life. The Romani Code is not written; the Romani people keep it alive in oral tradition. The kris is a traditional institution for upholding and enforcing the Romani Code. The code can be summarised in pillars; the main pillar representing the polar ideas of baxt (pronounced "baht") meaning honour and ladž (pronounced "Ladge") meaning shame. Linking to the article above in reference to "purity" they can also represent the idea of being "pure" or "clean" and "impure" and "unclean"  It is honourable, in Romani culture, to celebrate baxt by being generous and displaying your success to the public. The focus on generosity means sharing food is of great importance to some groups of Roma. Making lavish meals to share with other Romani visitors is commonplace and in some cases not having food to share is considered shameful. The cult of Saint Sarah in the shrine of Saintes-Maries-de-la-Mer, Southern France is a devotion associated with Catholic Romanies. While in India, the Romani people followed the Hindu religion. This theory is supported by the Romani word for "cross", trushul, which is the word which describes Shiva's trident (Trishul). A Hindu foundation means that the concept of kuntari, a universal balance, is central to the people's spirituality. Kuntari means that all things belong in the universe according to their natural place. However, animals such as the flightless hen and frogs, an animal with the ability to negotiate land and water, are considered to be out of balance and are, therefore, inherently unlucky. Consequently, Roma avoid hens' eggs and frogs. Roma believe in the idea of "pollution", whereby the human body is vulnerable to pollution following the breaking of certain taboos—pollution leads to a person becoming out of balance, like the frog and the hen. If such taboos are broken, restoration of one's purity can only be attained through a trial overseen by a tribunal of Romani elders. This tribunal determines whether a person is guilty or innocent and, in the case of the former, the subject of the trial must complete a period of isolation for the purpose of eventual reinstatement (in particularly severe cases of pollution, permanent estrangement has occurred, but this is apparently rare in the modern era). Such pollution taboos do not apply until a Rom has undergone puberty. Christianity and Islam have been adopted by Roma. Blessed Ceferino Giménez Malla is considered a patron saint of the Romani people in Roman Catholicism. Saint Sarah, or Kali Sara, has been revered as a patron saint in the same manner as the Blessed Ceferino Giménez Malla, but a transition occurred in the 21st century, whereby Kali Sara is understood as an Indian deity brought by the refugee ancestors of the Romani people, thereby removing any Christian association. Saint Sarah is progressively being considered as "a Romani goddess, the Protectress of the Roma" and an "indisputable link with Mother India". Roma often adopt the dominant religion of their host country if a ceremony associated with a formal religious institution is necessary, such as a baptism or funeral (their particular belief systems and indigenous religion and worship remain preserved regardless of such adoption processes). The Roma continue to practice "Shaktism", a practice with origins in India, whereby a female consort is required for the worship of a god. Adherence to this practice means that for the Romani who worship a Christian God, prayer is conducted through the Virgin Mary, or her mother, Saint Anne. Shaktism continues over 1,000 years after the people's separation from India. Besides the Romani elders, who serve as spiritual leaders, priests, churches, or bibles do not exist among the Roma. The only exception is the Pentecostal Roma. Bulgaria: In northwestern Bulgaria and Sofia and Kyustendil, Islam has been the dominant religion; however, in the independent Bulgarian state, a major conversion to Eastern Orthodox Christianity has occurred. In southwestern Bulgaria (Pirin Macedonia), Islam is the dominant religion, with a smaller section of the population, declaring themselves as "Turks", continuing to mix ethnicity with Islam. Romania: Approximately 85% of Romanian Roma are Orthodox Christians. Greece: The descendants of groups, such as Sepečides or Sevljara, Kalpazaja, Filipidži and others, living in Athens, Thessaloniki, central Greece and Aegean Macedonia are mostly Orthodox Christians, with Islamic beliefs held by a minority of the population. Following the Peace Treaty of Lausanne of 1923, many Muslims resettled Turkey, in the consequent population exchange between Turkey and Greece. Albania: Albania's Romani people are all Muslims. Macedonia: The majority of Romani people believe in Islam. Serbia: Most Romani people in Serbia are Orthodox; in the disputed territory of Kosovo the vast majority of the Romani population is Muslim. Bosnia, Montenegro and Herzegovina: Islam is the dominant religion. Croatia: Following the World War II, a large number of Muslim Roma relocated to Croatia (the majority moved from Kosovo). In the Balkans, the Roma of North Macedonia and southern Serbia, including the disputed territory of Kosovo, have been particularly active in Islamic mystical brotherhoods (Sufism)—Muslim Roma immigrants to Western Europe and America have brought these traditions with them. Ukraine and Russia contain Romani Muslim populations, as the families of Balkans migrants continue to live there. The descendants' ancestors settled on the Crimean peninsula during the 17th and 18th centuries, but most descendants migrated to Ukraine, southern Russia and the Povolzhie (along the Volga River). Formally, Islam is the religion that these communities align themselves with, and the people are recognized for its staunch preservation of the Romani language and identity. Most Eastern European Roma are Roman Catholic, Orthodox Christian, or Muslim. Those in Western Europe and the United States are mostly Roman Catholic or Protestant. In southern Spain, many Roma are Pentecostal), but this is a small minority that has emerged in contemporary times. In Egypt, the Roma are split into Christian and Muslim populations. For countless years, dance has been considered a religious procedure for the Egyptian Roma. In Turkey, the Romani people are Muslim and the males are circumcised, while the majority of Roma in Latin America have maintained their European religions, with most following Orthodox Christianity. Since World War II, a growing number of Roma have embraced Evangelical movements. For the first time, Roma became ministers and created their own, autonomous churches and missionary organizations. In some countries, the majority of Roma belong to Romani churches. This unexpected change has greatly contributed to a better image of Roma in society. The work they perform is seen as more legitimate, and they have begun to obtain legal permits for commercial activities. Evangelical Romani churches exist in every country where Roma are settled. The movement is particularly strong in France and Spain; there are more than 1,000 Romani churches (known as "Filadelfia" or simply el culto) in Spain, with almost 100 in Madrid alone. In Germany, the most numerous group is that of Polish Roma, with their main church in Mannheim. Other important and numerous Romani assemblies are in Los Angeles, Houston, Buenos Aires, and Mexico. The lăutari who perform at traditional Romanian weddings are virtually all Roma, although their music draws from a vast variety of ethnic traditions—for example Romanian, Turkish, Jewish, and Slavic—as well as Romani traditions. Probably the most internationally prominent contemporary performer in the lăutari tradition is Taraful Haiducilor. Zdob şi Zdub, one of the most prominent rock bands in Moldova, although not Roma themselves, draw heavily on Romani music, as do Spitalul de Urgenţă in Romania. Flamenco music and dance came from the Roma in Spain; the distinctive sound of Romani music has also strongly influenced bolero, jazz, and Cante Jondo in Europe. European-style Gypsy jazz is still widely practised among the original creators (the Romani People); one who acknowledged this artistic debt was Django Reinhardt. Romani music is very important in Eastern European cultures such as Hungary, Russia, and Romania. Performance practices by Romani musicians have influenced European classical composers such as Franz Liszt and Johannes Brahms. Several renowned classical musicians are Romani. The Romani language is spoken by millions of Romani people throughout the world. It is of the Indo-Aryan branch. Many Romani people are bilingual and can speak two or more languages. Each June, Gypsy Roma Traveller History Month is celebrated in London. International Romani Day is a holiday celebrated in Europe especially in Budapest, Bulgaria, Romania and Eastern Europe on April 8. Romani people wave the Romani flag on International Romani Day every April 8. In Hungary, there is a Romani influence on Hungarian food. Many Hungarian dishes have a Romani variation such as cigánypecsenye and goulash. Rigo Jancsi, a Hungarian dessert is named after a Hungarian Roma. Romani people cook family recipes such as bodag (cigánykenyér) in Hungary. There is a Romani restaurant called Romani Kafenava in Maribor, Slovenia. In Budapest, there is Romani restaurant called Romani Platni. In Romania, Romani people eat mămăligă. There’s a Romani cookbook called the Gypsy cookbook. Romani people drink a lot of tea and there is a tea brand based off Romani people called Zhena’s Gypsy Tea. There exist four well-known Romani theatres in the world, Romen Theatre, Romance Theatre, Romanothan and Phralipe, and also many small theatres. A stereotype that Romani people have psychic powers (e.g. fortune-teller) is still sometimes present, and some romantics attribute the invention of the Tarot cards to them. 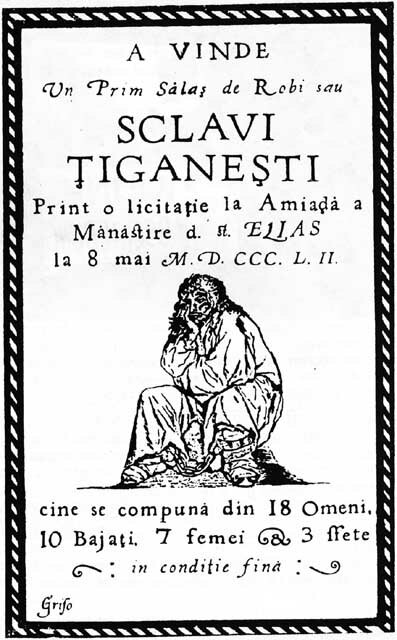 An 1852 Wallachian poster advertising an auction of Romani slaves. Because of their nomadic lifestyle and differences in language and culture, Roma and their more settled neighbours have held each other in distrust. The popular image of Roma as tramps and thieves unfit for work contributed to their widespread persecution. This belief is often cited as the etymological source of the term gyp, meaning to "cheat", as in "I got gypped by a con man." There are still tensions between Roma and the majority population around them. Common complaints are that Roma steal and live off social welfare and residents often reject Romani encampments. This has led to Roma being described as "perhaps the most hated minority in Europe." In the UK, travellers (referring to both Irish Travellers and Roma) became a 2005 general election issue, with Michael Howard, the then-leader of the Conservative Party promising to review the Human Rights Act 1998. This law, which absorbs the European Convention on Human Rights into UK primary legislation, is seen by some to permit the granting of retrospective planning permission for Romani communities. Severe population pressures and the paucity of greenfield sites have led to travellers purchasing land and setting up residential settlements almost overnight, thus subverting the planning restrictions imposed on other members of the community. Travellers argued in response that thousands of retrospective planning permissions are granted in Britain in cases involving non-Romani applicants each year and that statistics showed that 90% of planning applications by Roma and travellers were initially refused by local councils, compared with a national average of 20% for other applicants, potentially disproving claims of preferential treatment favouring Roma. They also argued that the root of the problem was that many traditional stopping-places had been barricaded off and that legislation passed by the previous Conservative government had effectively criminalised their communities by removing local authorities' responsibility to provide sites, thus leaving the travellers with no option but to purchase unregistered new sites themselves. Law enforcement agencies in the United States hold regular conferences on the Roma and similar nomadic groups. In Denmark, there was much controversy when the city of Helsingør decided to put all Romani students in special classes in its public schools. The classes were later abandoned after it was determined that they were discriminatory and the Romani students were put back in regular classes. 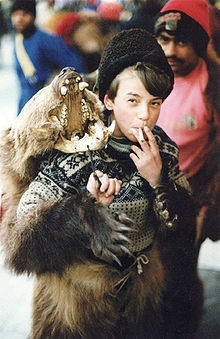 Romani boy in bear costume, part of entertainer team for working Christmas crowds. Budapest, Hungary. In Eastern Europe, Roma often live in depressed squatter communities with very high unemployment, while only some are fully integrated in the society. However, in some cases—notably the Kalderash clan in Romania, who work as traditional coppersmiths—they have prospered. Although some Roma still embrace a nomadic lifestyle, most migration is actually forced, as most communities do not accept Romani settlements. However, each year in May approximately 10,000 to 15,000 Romani people go on a pilgrimage to Les-Saintes-Marie-de-la-Mer in Southern France. Roma arrive in caravans for celebrations, weddings and religious ceremonies. Many countries that were formerly part of the Eastern bloc and former Yugoslavia have substantial populations of Roma. The level of integration of Roma into society remains limited. In these countries, they usually remain on the margins of society, living in isolated, ghetto-like settlements (see Chánov). Only a small fraction of Romani children graduate from secondary schools, though numerous official efforts have been made, past and present, to compel their attendance. Roma frequently feel rejected by the state and the main population, creating another obstacle to their integration. In the Czech Republic, 75% of Romani children are educated in schools for people with learning difficulties and 70% are unemployed, compared with a national rate of 9%. In Hungary, 44% of Romani children are in special schools, while 74% of men and 83% of women are unemployed. In Slovakia, Romani children are 28 times more likely to be sent to a special school than non-Roma, whilst Romani unemployment stands at 80%. In 2004, Lívia Járóka and Viktória Mohácsi of Hungary became the two current Romani Members of the European Parliament. The first Romani MEP was Juan de Dios Ramírez Heredia of Spain. Seven former Communist Central European and Southeastern European states launched the Decade of Roma Inclusion initiative in 2005 to improve the socioeconomic conditions and status of the Romani minority. ^ "Who are the Roma people?". New Internationalist. 2013-10-28. Retrieved 2019-04-02. ^ Berthier, Jean-Charles (1979). "The Socialization of the Gypsy Child" (PDF). EBSCOhost. Retrieved 12 March 2017. ^ Wiley, Eric. “Romani Performance and Heritage Tourism: The Pilgrimage of the Gypsies at Les Saintes-Maries-De-La-Mer.” TDR, vol. 49, no. 2, 2005, pp. 135–158. Received 9 March 2017. ^ Matras, Y. "Romani Project - The History of the Romani Language". Romani Project- Romani Linguistics and Romani Language Projects. Yaron Matras. Retrieved 2015-02-27. ^ Hubschmannova, Milena. "Origin of Roma". ROMBASE. Retrieved 2015-03-03. ^ a b Silverman, Carol (24 May 2012). Romani Routes: Cultural Politics and Balkan Music in Diaspora. Oxford University Press. pp. 71–79. Retrieved 4 March 2015. ^ Weyrauch, Walter. O (13 August 2001). Gypsy Law: Romani Legal Traditions and Culture. University of California Press. p. 169. Retrieved 4 March 2015. ^ Brabant, Malcolm (6 October 2003). "Roma rivalry over child bride ban". BBC News Online. BBC News. Retrieved 24 August 2013. ^ a b Henry McDonald (3 September 2007). "Gardaí hunt gang accused of seizing Roma child bride". The Guardian. Retrieved 24 August 2013. ^ a b "Building the Capacity of Roma Communities to Prevent Trafficking in Human Beings". Warsaw: Office for Democratic Institutions and Human Rights. June 2007: 17. ISBN 8360190372. Retrieved 24 August 2013. ^ a b Pamporov, Alexey (2006). "Roma/Gypsy population in Bulgaria as a challenge for the policy relevance". Sofia: Bulgarian Academy of Sciences. Retrieved 24 August 2013. ^ Oprea, Alexandra (21 July 2005). "Child Marriage a Cultural Problem, Educational Access a Race Issue? Deconstructing Uni-Dimensional Understanding of Romani Oppression". European Roma Rights Centre. Retrieved 24 August 2013. ^ Saul, Nicholas; Susan Tebbut (2005). Nicholas Saul, Susan Tebbutt (ed.). The role of the Romanies: images and counter-images of 'Gypsies'/Romanies in European cultures. Liverpool University Press. p. 218. ISBN 978-0-85323-689-4. Retrieved 2010-03-03. ^ Guy, Will (2001). Will Guy (ed.). Between past and future: the Roma of Central and Eastern Europe. Univ of Hertfordshire Press. p. 254. ISBN 978-1-902806-07-5. Retrieved 2010-03-03. ^ a b c Matras, Yaron (6 January 2015). The Romani Gypsies. Harvard University Press. p. 86. ISBN 067436838X. Retrieved 6 March 2015. ^ a b c d "Roma". Countries and their Cultures. Advameg, Inc. 2012. Retrieved 26 December 2012. ^ "Restless Beings Project: Roma Engage". restlessbeings. Restless Beings. 2008–2012. Retrieved 26 December 2012. ^ "BLESSED CEFERINO GIMENEZ MALLA 1861-1936". Saviour.org – Visit the Saviour. Voveo Marketing Group. December 2012. Retrieved 26 December 2012. ^ Ronald Lee (2002). "THE ROMANI GODDESS KALI SARA". Romano Kapachi. Ronald Lee. Archived from the original on 27 January 2013. Retrieved 26 December 2012. ^ a b c d e f g h Marushiakova, Elena; Popov, Veselin. "Roma Muslims in the Balkans". Factsheets on Roma. Council of Europe. Retrieved 24 August 2013. ^ Gadalla, Moustafa (2004). Egyptian Romany: The Essence of Hispania. Greensboro, North Carolina: Tehuti Research Foundation. ISBN 1931446199. Archived from the original on 30 August 2012. Retrieved 26 December 2012. ^ a b Bernal, Jorge (5 May 2003). "The Rom in the America" (PDF). United Nations Commission on Human Rights. Retrieved 24 August 2013. ^ Event to mark Gypsy and traveller day. June 5, 2015. ^ "Gypsies are 'Europe's most hated'". BBC News Online. BBC News. 26 April 2005. Retrieved 24 August 2013. ^ "Tory traveller proposals: Your views". BBC News Online. BBC News. 23 March 2005. Retrieved 24 August 2013. ^ "This Week's Highlights: Gypsies". Inside Out. BBC Online. 19 September 2005. Retrieved 24 August 2013. ^ Hector Becerra (30 January 2006). "Gypsies: the Usual Suspects". The Los Angeles Times. Archived from the original on April 13, 2006. Retrieved 24 August 2013. ^ "Danish Authorities Find Romani Classes Illegal". European Roma Rights Centre. 16 December 2004. Retrieved 24 August 2013. ^ Gary Younge (8 January 2003). "Shame of a continent". The Guardian. Retrieved 24 August 2013. A Roma Journey A Roma Journey provides explores Romani culture in the Balkans and beyond, including digitised texts, photographs, paintings and recordings of traditional songs. Romani Lives - Lungo Drom.